Imagine all the things you never got around to doing… maybe because you were afraid, or you just never got the chance. Passioneering is an opportunity to go out and pursue your passion through volunteering! Learn more about passioneering in this interview. My name is Sarafina, and I am one of many passionate volunteers working to make TEDxOdense amazing. My passion - other than TED talks! - is writing, which is why I am the copywriter on the marketing team. I recently met with Steffie Limère at Coworking Plus, a cooperative working environment. I figured if anyone could tell me about the other side of TEDxOdense, it would be her! 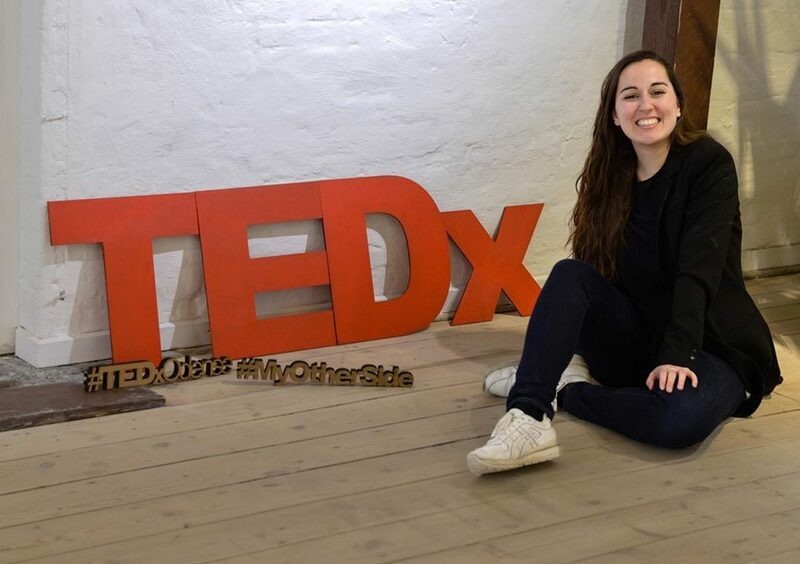 Steffie, the amazing head organizer of TEDxOdense, has experience with pretty much every side of TEDx… She has organized TEDx events in Odense and volunteered at TEDx events around Europe. In 2016 she even gave a TEDx talk about how to turn volunteers into passioneers. I know you already gave an entire TEDx talk about it, but, for the sake of our readers, what exactly is a passioneer? A passioneer is a volunteer driven by passion. My first experience with passioneering was together with Adam Montandon, who you may know as the speaker curator and coach of TEDxOdense, when we started the Factory of Imagination. For this event we took over an old warehouse, gathered some brilliant minds and let them create whatever they could imagine. This event was quite unique; we weren’t just working with volunteers, at this event, we were creating a platform where people could do their own thing. The volunteers could tell us their idea and we would help them make it happen. We did this because we wanted to encourage people to apply their imagination to making something, not just thinking about it. This experience of helping people to actualize their brilliant ideas fuelled my passion for working with passioneers. What do people get out of passioneering? I have seen so many people grow through passioneering. What they get out of it is often something to put on their resume that shows what they really love doing and what they can achieve when given the chance. At TEDxOdense, we give our volunteers the freedom to use their imagination and create something – just like you’re doing with this interview now – with the TEDxOdense brand standing behind them. A great example of this is Lisa, who was our social media manager for TEDxOdense 2017. It was the first TEDxOdense event, which meant Lisa could show TEDxOdense's social media as an example of what she could achieve. This actually helped her to get a job working with social media at the German American Chamber of Commerce in New York. The other great thing people get out of passioneering is a chance to do something they normally don’t get the chance to. A good example is Simon, who studied Multimedia design at Lillebælt Academy, so everything he was doing was on the computer. We saw that he had a creative mind and was good at working with his hands. So, we told him to give us a list of the tools he needed and we would get them for him. We put our trust in him and he made some amazing creations that he would probably never have gotten the chance to make otherwise! Do you know of other events/organizations that foster passioneering? There are some great passioneering organizations – TEDx groups around the world do it very well! When you bring a group of volunteers with a passion for the same thing together, that’s where the magic happens. There are several great passioneer-based organizations around. One that is especially relevant is Sofar Sounds. Sofar Sounds is similar to TEDx in that it is an international phenomenon which came to Odense a year ago. Actually, many of the passioneers on the core team of TEDxOdense are also volunteers at Sofar Sounds Odense! What criteria do you look for when picking volunteers? We always look for the candidates who have a spark in their eyes – we need to know they come, bringing their passion. We also look for volunteers who are motivated to try new things, and who have the skills needed for the job. After all, we don’t have all the answers, so we depend on volunteers coming with the skills and ideas we need, to make the event great. What is your favourite part of organizing volunteer events? If, by the end of the event, the volunteers tell me they were able to put their passion into it, that makes me really happy. We give people our trust, that we believe in them to create something great. Instead of to do’s, we give small suggestions, which are just enough to get volunteers started in the right direction, but keeps enough freedom to make it their own creation. We treat our passioneers as the most important part of the event, which they are. Once you realize and act on this, they will act on it too. We create a bond of trust and a safe environment. It lets our passioneers feel like they can come with any idea or problem.